The term “progressive” makes us think of heavily urbanized areas packed with young liberals. Rarely does the term flirt with our ideas of the Midwest. 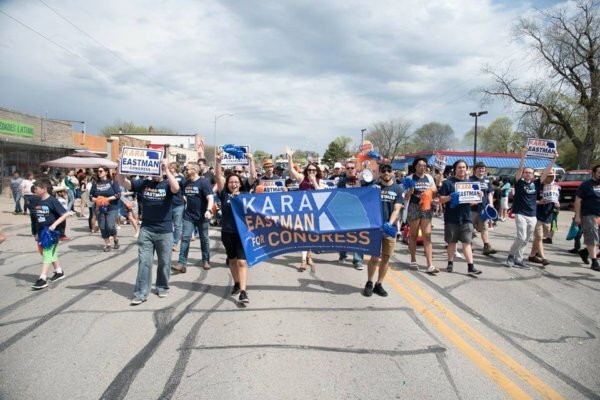 Kara Eastman began her congressional campaign after her mother passed away nine months ago, unable to pay the increased balance of her prescription drug. Eastman ran with the “Medicare for All” progressive platform in the traditionally Republican Nebraska and won the Democratic nomination in Nebraska’s Second District. 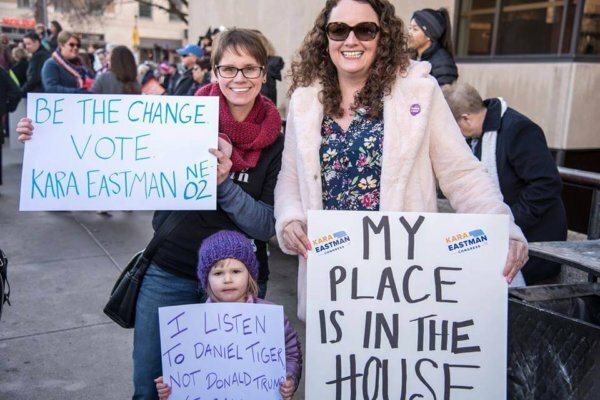 With her background in social work, Eastman’s drive and ability to connect with the community has helped her make it through the primary with flying colors. And she’s seen consistently strong polling since. Her next stop: helping the largest community available, the United States. 1997: Graduated from Loyola University of Chicago with a Master’s in Social Work. 2002–2005: Became the Program Director for Extra Hands for ALS. 2005–2006: Became Program Director at the Friendship Shelter. 2006-Present: Named the President and Chief Executive Officer of the nonprofit Omaha Healthy Kids Alliance. 2015–Present: Named Vice Chair of the Metropolitan Community College Board of Governors. 2017–Present: Became Board Member of the Lead and Environmental Hazards Association. Q: At College Magazine we work with EMILY’s List, Emerge America, Human Rights Campaign, Higher Heights, She Should Run, Running Start, Victory Fund and IGNITE on an initiative to fight for equal representation in Congress called 50by2050. What are your thoughts on the goal of achieving 50% of women in Congress by 2050? A: That sounds like a great idea. Right now, I think with the number of women in the country being a little bit more than the number of men and the fact that the number of women in Congress does not match that perspective, is a little problematic. Obviously, having women in positions of leadership is a great idea. Q: What advice do you have for young women running for office? A: There are a number of reasons why women haven’t traditionally run for office. Some of those are that we tend to be overextended in terms of taking care of our families and also working. I also think that women haven’t always necessarily seen themselves as people who should be in elected office because the model hasn’t been there for us. Right now, there are so many different kinds of women running. My background in social work is a great example. It’s not exactly what we traditionally think about when we think of people in office, that having a social work background would make someone a good fit for a Congressperson. Actually, the opposite of that is true. Social workers are trained to look at things holistically, to see things in a systems perspective and to solve problems—so I believe that is a perfect fit for elected office. I think that of a number of different backgrounds, we’re seeing a lot more people—teachers, scientists, people with a military background—who are women who are willing to take that leap forward. It’s a challenging leap. It’s hard to put yourself out there, but the more that we do it, the more I think it will become the norm. Q: Have you faced any specific challenges as a woman running for office? A: It’s hard for me to separate the challenges I’ve faced based on any one particular identity. But I think there are questions as a woman that I’ll be asked that men just aren’t asked, especially about my appearance—like advice that people give me about what to wear or how to do my hair, even what to say and how to say it. Now, there are some men that face that as well, but I do think that women get coached a little bit more than men do. Q: Can you explain your role on the Metropolitan Community College Board of Governors? What initiatives were you most passionate about? A: In Omaha, the community college—which is actually one of the top ten community colleges in the country—has an elected Board of Governors. We are a political subdivision and we are politically elected. In 2014 I ran for the Board and won. Now, I serve as Vice-Chair of the Board of Governors. Our responsibility is really just general oversight for the college. Q: What was the driving force behind the creation of your nonprofit, Omaha Healthy Kids Alliance? A: My background is in startup nonprofits, and so I consider myself a social entrepreneur in some ways. I was hired to start the organization because of that background. When it started, the sole purpose of the organization was lead poisoning prevention because Omaha is the largest residential Superfund site in the country as a result of lead contamination. As we’re going in and educating people about the lead issue, it became very clear that there were a number of other environmental hazards, and other hazards, inside the homes making people sick. In 2010 we expanded the mission of the organization to become a healthy housing organization. That was my responsibility. I raised about $13 million to invest in energy efficient, safe, healthy housing for kids in our community through that work. Q: How did it feel to beat former Congressman, Brad Ashford? What did that win mean to you? A: Running [for Congress] has been the greatest honor of my life. Obviously, it was a big deal to beat a former Congressperson. But the reality is, now we just need people in these positions who are going to make sane, sound decisions for our country and represent the values of the constituents of this district. I’m grateful for the primary. It gave me an opportunity to get my name out to the public and to start knocking on people’s doors. We knocked on over 60,000 doors during the primary. Obviously, it felt great to win, but right now we just need to keep our eye on the prize. Q: You ran on the campaign of “Medicare for all.” Will this be your focus if you make it Congress? A: Absolutely. I’m running because of my mom’s own outrageous prescription drug costs. Prescription drugs are crippling our economy; they’re crippling our ability to be healthy. I’ve talked to people now and tell the story about my mom and this $2,500 pill that she’s taking. I find people who are paying thousands and thousands, even tens of thousands, of dollars every month in prescription drugs. It’s absolutely outrageous. And having to choose between taking medication and putting food on the table, or even deciding that they aren’t going to take the medication—which is what my mom had to do—and suffering the consequences, is, to me, not the way in which we should treat Americans. Q: What has it been like running your first congressional campaign? A: I would say it’s about 95 percent fun. It’s exciting, and there’s always something happening. Campaigns move very fast. For me the most exciting part has just been being able to talk to people at their doors. We ask them, “What are you looking for in your representative, and what are the issues that concern you the most?” Those conversations have been so enlightening, and I think that’s the way that campaigns should run. More importantly, [that’s] the way people should govern: actually talking to people and listening to them. Q: What are your expectations for November, especially running against a Republican incumbent? A: We have to work really hard to win the seat. It is a swing seat. We did have our first poll numbers come back and they’re very strong. We’re about neck and neck. This is winnable, we just have to continue to ignite the base. We had almost double turnout from the 2014 primary this May. We saw about a 68 percent increase from 2016 in Democratic turnout. That is key to winning this: getting people inspired to vote. The way to do that is by talking to them and telling them that you want to earn their vote. It’s not something that we can be complacent about and expect. It’s something that the people who are running have to go out and actually earn. Q: What response have you seen running as a progressive in a traditionally Republican state? A: I have the fortune of running in this district which gave an electoral college vote to Obama in 2008 and caucused for Bernie Sanders. So I push back a little bit on that “traditional red” idea. Nebraska, in its history, has been more of a prairie progressive or populous state. I’ve been finding in going out and talking to people that they’re excited. They’re excited that a Democrat is running. They’re excited that somebody who represents their values is running. And they’re excited to have somebody that’s going to stand up for them. I think the experience and the expertise that I’ve gained through working with the community, and running on my principles and values—saying, “Look I’m going to tell you who I am. I’m going to be honest with you, and run on integrity and authenticity”—will help me get things done. No matter where you are or where you come from, every accomplishment begins with taking the first courageous step. “It’s a challenging leap. It’s hard to put yourself out there, but the more that we do it, the more I think it will become the norm.” Women everywhere deserve your courage. Gaining support from the people around you begins with simply opening yourself up to their ideas. “The way to do that is by talking to them and telling them that you want to earn their vote. It’s not something that we can be complacent about and expect.” Showing the community that you value their opinions and showing a willingness to work with them opens up entirely new doors for opportunity. Brooke is a sophomore at William and Mary studying English. She enjoys reading and writing, very strong coffee, and all things chocolate.